I think Slow Laundry is all about awareness. To really understand and appreciate your laundry, you have to be fully aware of it – you have to be present in the moment, with all your senses attuned to the various stains and smears. That’s why I’m really frustrated that lately, Cate has started drinking wine while she washes our clothes. It started off as just a “nightcap” when she started the nightly 10 pm wash. I usually go to bed and just let Kate handle this wash, because I like to get a good night’s sleep, so at first I didn’t mind. We could use a little more of this in our house. But then she also started having a glass of wine during our 6 pm wash, which is the only wash we get to share together as a couple. So now she’s drinking during almost half of each day’s shared laundry sessions. I’m not sure why she’s doing this. So far I haven’t asked her about it, other than raising my eyebrows and/or rolling my eyes and letting out a little “hmph” every time she takes a sip. But it’s getting to the point where I feel like I’m the only one truly doing laundry in our house. I’d appreciate any advice on how I can help her understand that by dulling her senses, she’s missing out on a lot of the joy of doing laundry. Success! I’ve proven the haters wrong (Cate, our neighbor Noah, etc.) who thought I shouldn’t try to dig a well in our backyard. When I was 8 feet down into the hole I’ve been digging, my pickaxe broke through some sort of long, cylindrical tan rock into an aquifer. Water started gushing out immediately – I barely had time to climb back up before the entire well filled up! When I was originally planning this well, I thought I would need to build a bucket-lowering contraption. I was looking forward to this because I’m a pretty DIY guy and I probably have a natural aptitude for carpentry. But as it turns out, my well is so bountiful that the water actually overflows into our yard. So there’s no need to lower a bucket – I can just scoop water out of our yard, which is also filling up with water. And it’s lucky my well is so bountiful, because coincidentally the water pressure in our house has suddenly dropped to a trickle. Good thing I no longer need to count on the DC Water and Sewer Authority for my water! Summer is finally here. And that doesn’t just mean we get to hand-wash white pants—it means family vacations. Now, I’ve met people who claim to be part of the Slow Landry movement, but who don’t hand-wash when they’re on vacation. Frankly, this suggests that they somehow want to take a “vacation” from doing laundry! Slow Laundry is perfectly consistent with family vacations – you just need to plan ahead and carve out plenty of time and money. And just as with traveling itself, when it comes to hand-washing laundry the reward is not in the destination, but in the journey. So how to do it? It all depends on your vacation. For every trip, there is a strategy for making sure that the magic of hand-washing laundry is part of the fun. Stop at a truck stop and fill your washtub in the shower (this is also a great way to meet fellow travelers, by the way). Boil it by sitting the tub on your hood and revving the engine for an hour or so. Then put your laundry in the tub, get back on the highway and start scrubbing. And here’s a tip – try driving over potholes, rumble strips and stray retread to help agitate the laundry. Just 59 more minutes to go! The good news is that in a hotel room you’ll have a bathtub that will fit the whole family’s laundry. And if you use a propane heater to heat your washwater, most hotel fire alarms won’t pick it up. The bad news is that we’ve had problems with hoteliers complaining when we hang laundry out the hotel windows to dry. But keep in mind that in most jurisdictions, it takes a few hours to evict you from a hotel room: more than enough time to dry the clothes a little before you have to move on. Remember that when you check in, your room has probably been stocked with machine-washed sheets and towels. I like to call ahead and request hand-washed linens. And you’d be surprised: most of the time, I get a “Hah! Yeah sure, no problem! We’ll get right on that! Hah!” It’s always encouraging to find a fellow Slow Laundry supporter. 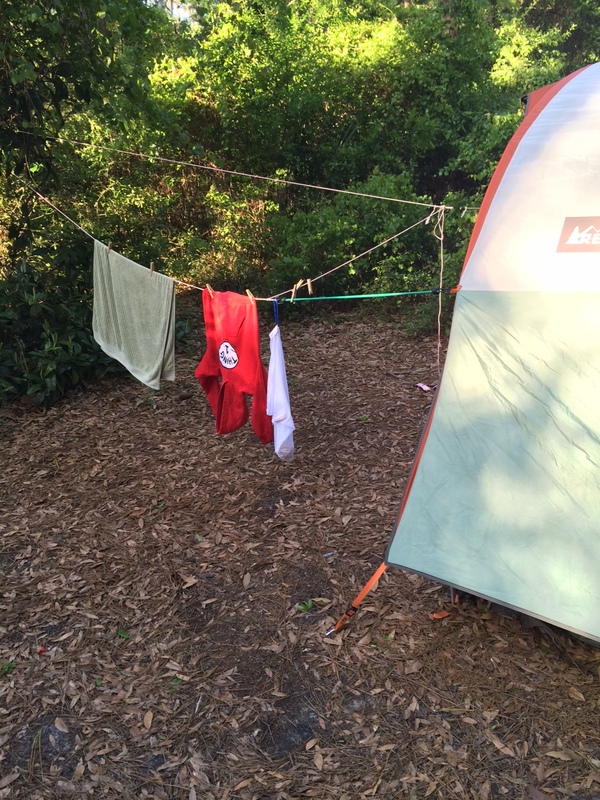 Camping is the heart and soul of Slow Laundry. This is when we can most closely approximate the natural and traditional way that our ancestors washed clothes: in the open air, hunched over a creek, swatting at mosquitoes. I wish we could move to the woods full-time, but Cate has told me to stop bringing it up. A lot of park rangers have let the power go to their head, and they’re liable to give you a hard time – “you can’t rinse soapy clothes in the stream,” “you can’t drape wet clothes over other people’s tents” and so forth. So you may need to do your laundry by moonlight. When building a fire to heat your washwater, it’s important to remember that in the hot summer months, wood will go up like kindling. So be sure to build your fire close to a lot of underbrush, so you have quick access to a lot of good, dry wood. We ran out of space so hung laundry by the tent next door. It was exciting for them when they woke up and saw it! Are you ready to join the “Mile High Club” of Slow Launderers who’ve washed their clothes while 30,000 feet above the ground? It’s easier than it sounds, and there are two good options. Option one is to do laundry at your seat. Just bring a plastic bag to use as a washtub, and ask the flight attendant for a dozen cups of hot water. (And don’t take any guff on this – you bought that seat and you’re entitled to as much hot water as you want.) Once the water, the clothes and the soap are in the bag, tie the end off and bang the bag against the window for a few minutes. You’ll find this is a great conversation-starter! The first time this happened to me, when I finally finished and left the lavatory, the flight attendant raised her eyebrow and asked me “you were alone in there?” I think it must have blown her mind that I could tackle a load of laundry all by myself! My latest attempt at cross stitching. I know it doesn’t look that bad, but it was supposed to be a picture of our cat. The problem is, I hate sewing, and I’m not very good at it. So I’ve come up with a few alternatives to the thread and needle, and I thought I’d share them with you so you can benefit from my ingenuity. The only drawback is that staples might eventually start to chafe. D.J. claims that the staples holding together the waistband of his underwear are so painful that it’s hard for him to concentrate at work, but I’ve urged him to just channel the pain and use it to make himself a better database architect. Duct tape is easy to use and can patch large holes, but unfortunately it is also pretty noticeable. Unless you are repairing a garment that’s made entirely out of duct tape. Hot glue will fix just about anything, but it doesn’t hold up in the wash, which means you have to keep hot-gluing the same garments over and over. I recommend adding some “hot glue time” to your morning laundry routine, in between greasing your iron and building a fire to boil the washwater. After adding a few strategically placed stains to make the clothes look used, no one will be the wiser. A nice touch is to sew a few stiches wherever the hole in the original garment was, to make it look like you just did a really good job of patching it up. Since we started hand-washing our clothes, they’ve been experiencing a lot more wear and tear. In my view, this is good thing; it proves that hand-washing is much more powerful than machine washing. With a washing machine, you never really know if you’re going to get a stain out. But with a washboard and a few hours’ spare time, I can scrub away at that stain until not even the fabric is left. Unfortunately, my office is business-casual. I say nothing is more casual than holes in your clothes, but my boss Pam has told me (a few times) that she disagrees. So I need to fix these holes. I’m SO SORRY my shorts don’t fit my boss’s image of what “business casual” looks like. Cate thinks the solution is to buy new clothes. Maybe she’s happy being a mindless consumer drone, buying yet another new blazer because the sleeve on your old blazer came off in the washtub again. But blazers are not a renewable resource. Whatever they make wool from, someday it’s going to run out. So I’m been encouraging Cate to spend a little time mending our clothes, in addition to washing them. And honestly, I’m jealous of her. If only I could spend my days darning socks and repairing the elastic bands in underwear! But some of us have to work for a living.